The photos below were taken as part of an ongoing photographic survey of Troopers Hill undertaken for Bristol City Council by Rupert Higgins of Wessex Ecological Consultancy and the Friends of Troopers Hill. 35 photographs are taken from fixed points on the hill so that changes in the spread of different plant species can be monitored. From 1994 to 2008 they were taken every other year. In 2010 it was agreed to move to 5 year cycle for the photo survey to match the review dates of the Management Plan so the survey was delayed until 2011. This was in view of the increased site presence of Bristol Parks and Friends of Troopers Hill monitoring vegetation as part of ecological management. The 2016 survey has now been completed and the report can be seen below, this will be used to update the Management Plan in 2017/18. All these surveys have been funded by Bristol City Council. For six of these photos we have uploaded the full set of photos since 1994. Clicking on the thumbnails below will allow you to click through to see the photos from all the surveys 1994 to 2016 together with a more detailed description of the changes that can be seen. The photographs are taken in August each year. Location Map for the above photographs. The changes on part of Troopers Hill since May 2006 can also be seen on our 'Through the Seasons' page where there are photos of the hill taken monthly from the same spot. A comparison with a similar view from 1998 can be seen here. For a longer term view of the changes on the hill you can look at some of the photographs of the hill on our Old Photographs page. Some of the sets have a Then & Now feature to let you see how the vegetation has changed over time. We also have two photographs of Troopers Hill in the 1960s which were posted on facebook. 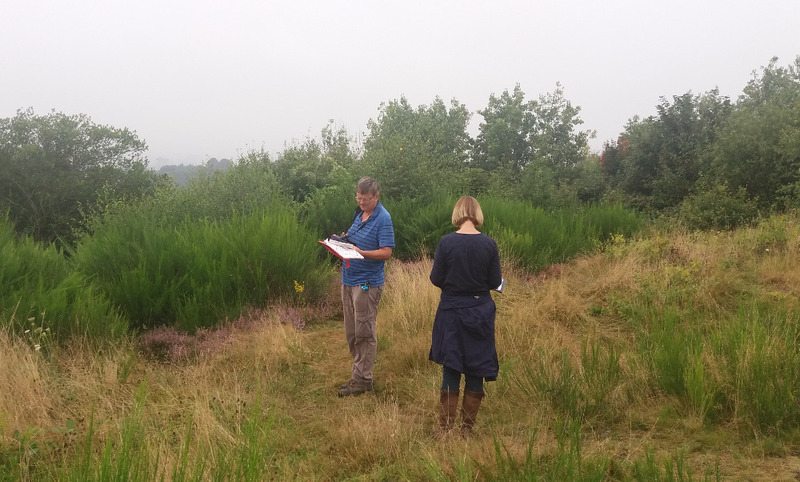 Rupert Higgins of Wessex Ecological Consultancy took the photos for the 2016 survey on 25th August. Becky Belfin, Nature Conservation Officer for Bristol City Council and Rob Acton-Campbell of Friends of Troopers Hill joined him to discuss some of the issues raised. The report can be seen below.